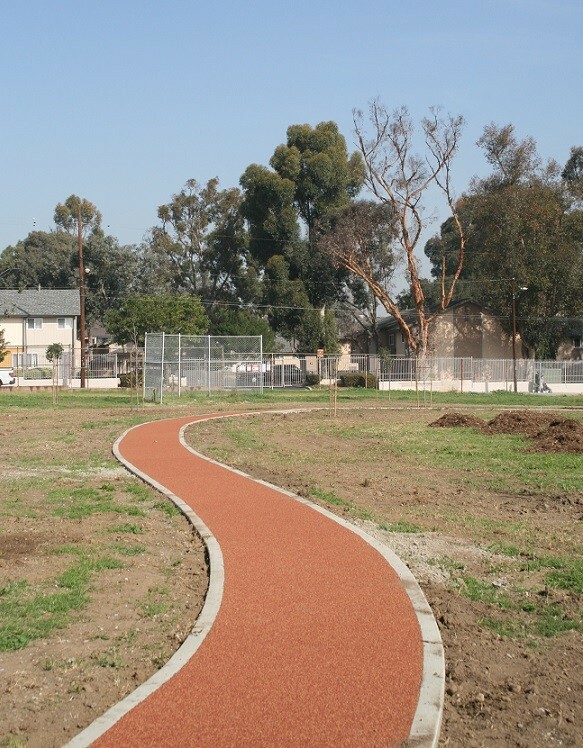 A Rubberway Sidewalk installation was recently completed at the Vanguard Learning Center as part of an Urban Greening Project for the Compton Unified School District. The two layer, 4,300 square foot pathway serves as a walking and jogging trail for the community and meanders around the newly constructed outdoor learning center which includes a community garden, drought tolerant landscaping, shade trees, and a system of bio-swales. The formerly under-utilized school property was turned into a vibrant outdoor learning center to educate youth and residents on composting, smart gardening, and other environmental issues such as water conservation. By incorporating various elements such as pervious pavement, trees, bio-swales, and drought tolerant landscaping, this project provides environmental benefits in the form of air and water quality improvements while giving a new life to an unused space. Implemented by the Los Angeles County Department of Public Works, this project utilized state grants to fund a quarter of the project's costs. A Tire Derived Product (TDP) Grant was awarded by the state for the construction of the Rubberway Sidewalk walking and jogging trail. Rubberway Sidewalks utilize recycled post-consumer tire rubber and are a safe, comfortable, non-slip surfacing alternative to concrete and asphalt. Urban Greening Program Grants from the State Natural Resources Agency are designed to provide residents with critical community improvements that benefit the environment and enrich the lives and improve the health of the community.